Bogotá-born Catholic Ork merc, now a Ghoul. Dead. -Ortega: Real SIN. Known by Shedim. -Panko Victorious, R4, burned in ACHE. Ramon Ortega is a Colombian Ork merc. 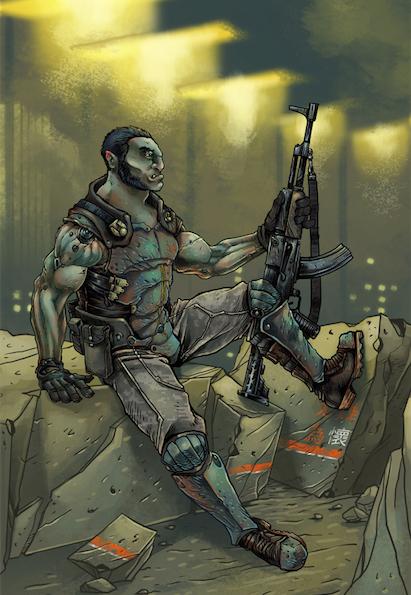 He tends to dress in distressed military fatigues and body armor, and he has Catholic-influenced tattoos, as well as those representing Bogata, and a black star for his (former) merc outfit. He’s a bit less bulky than some Orks, perhaps, but still is a pretty well-muscled fella. He has close-cropped hair. He tends to favor an assault rifle and a big revolver, but will use sniper rifles, machine guns, rocket launchers, sharp sticks… basically whatever the situation calls for. He’s relatively cool and professional. He’s very Catholic, into Liberation Theology, and has a bit of a moral crusade to protect innocents, specifically children. He wears an iconic Saint Michael medal, like so many other Catholic soldiers all over the dang world. They love that wacky archangel. He’s no stranger to violence and has a scar or two. Also, he’s equally comfortable in both urban environments and the jungle, and this is represented by his style. He still has his original eyes (with some implants in there), but has dermal armor that might be noticeable. 16 And Ehud made for himself a sword with two edges, a cubit in length, and he bound it on his right thigh under his clothes. 17 And he presented the tribute to Eglon king of Moab. Now Eglon was a very fat man. 18 And when Ehud had finished presenting the tribute, he sent away the people who carried the tribute. 19 But he himself turned back at the idols near Gilgal and said, “I have a secret message for you, O king.” And he commanded, “Silence.” And all his attendants went out from his presence. 20 And Ehud came to him as he was sitting alone in his cool roof chamber. And Ehud said, “I have a message from God for you.” And he arose from his seat. 21 And Ehud reached with his left hand, took the sword from his right thigh, and thrust it into his belly. 22 And the hilt also went in after the blade, and the fat closed over the blade, for he did not pull the sword out of his belly; and the dung came out. 3 Suffer hardship with me, as a good soldier of Christ Jesus. 4 No soldier in active service entangles himself in the affairs of everyday life, so that he may please the one who enlisted him as a soldier. Possible CFD infection. Recently became a ghoul, which may have fought off CFD. Has a microbomb, running silent, set to trigger on the phrase “Scorpion Gallery Scarf.” He has come to believe that God is testing the people of Earth through HMHVV- those who emerge as sentient ghouls are the sane, and take the communion of true flesh, and those who emerge feral are the damned and must be destroyed. He is trying to get involved with the Ghoul Liberation League in Chicago. Success! Welcome to ConfessAnon, the only officially-sanctioned confession site in the Matrix. Please log in to connect with a priest to give your confession and receive absolution. Please note: ConfessAnon will not maintain any record of your confession, but keep in mind that any personal information given to a priest could potentially link you to specific crimes, and could potentially be used to prosecute you for specific actions, depending on your jurisdiction. Please keep personal information to a minimum. Success! You are now connected with FATHER ESPARDA. †: Welcome, my child. Please unburden yourself, and prepare to receive absolution. Pænitent: In el nombre del padre, y hijo, y el espirito santo, Amen. Bless me padre, for I have sinned. It has been three months since my last confession. †: Go on, my child. Pænitent: I have lusted in my heart, and I have had impure thoughts. I have taken the lord’s name in vain, and I have lashed out in anger and struck men on several occasions. While I have not stolen, I have allowed others to steal, and protected them in their pursuits. I have often not been able to keep the sabbath holy, due to my profession. I have lay with women. I have drank to excess, and occasionally have used harder substances in the line of duty. †: This is quite a list, my child. Pænitent: There is certainly more, padre. I lead an interesting life. I have knowingly assisted in actions that likely has led to the deaths of many. I have knowingly assisted in attacking entire villages in the pursuit of our enemies. †: Have you… killed, my child? Pænitent: Never, padre. I have never done that, and never allowed it to happen. I will never allow that to happen. I would stop at nothing to prevent this. My hands will drip red with even your blood before I allow an innocent to be harmed, padre. †: I… I understand, my child. Your penance is fifty Hail Mary’s and you must recite The Lord’s Prayer three times a day until your next confession. †: Yes, my child. Please go in peace. Pænitent: Thank you, padre. Oh, and padre? Pænitent: I will one day find you. You may have the Lord’s forgiveness, but I am not so kind. Connection lost. You have been kicked from the server. Serve the Lord, and please have a blessed day. Ramón Ortega was born in the slums of the free city of Bogotá in 2054. He was raised in a very large Ork family, and at an early age proved that, while maybe not the strongest Ork, he was certainly one of the fastest. As a youth, he was something of a minor star futból player in the favela. Unfortunately, at puberty he was shown to be prone to illness, likely due to the terrible living conditions he was raised in. As this primary dream of escaping the shadows of Bogotá withered, he drew great strength from his Catholic faith, and for a time considered a career in the church. It was clear, however, that he did not have the social skills to be a priest, and what little schooling he had was plagued by bouts of violence. He seemed to be destined to a short, violent life of little consequence, like so many of his brothers and sisters in the slums. Ramón proved to be braver than most, though, and he would often spend time in the terrifying jungles that encroached upon the southern half of the city with little more than his body and his faith to protect him. When he was 16, a local merc company decided to hire him based on his tenacity and familiarity with the jungles, and he found solace in the structure that they provided. At some point, he saw what the warring factions were doing to the children of Bogotá, and he vowed never to allow children to be harmed again, if he could help it, a vow he keeps to this day. The recent surprise attacks by the Aztlan strike teams on Amazonian merc companies left him alone, without his former friends and colleagues. Ramón had little choice but to flee the increasingly-violent city, and has taken to running the shadows. He one day dreams of opening an orphanage for the children of Bogotá. For the mean while, he tithes 10% of his income not to the church directly, as there are many parts of the overall church that he disagrees with, but to various Catholic charities. Primarily this is an independent charity called Agnos Belli Caritate, literally the Lambs of War Charity, which runs orphanages in war-torn parts of the globe. He will occasionally help out with Catholic Relief Services as well, but prefers ABC, as it seems to more directly help the children, and is less beholden to the Vatican or other powerful church institutions.